Trevor Foley will be the first person to tell you that the steeplechase was an experiment of sorts. You see the Citrus Park Christian rising senior is a distance standout and one of the top cross country returners in the state. As a way to mix up his training and the monotony of cross country long runs, he decided to throw some barriers in. "It's hard to believe but Trevor's training has been 65-75 mile weeks," said Coach Ray Friedman. "Although we were able to have two of the speed workouts around five days before each race." 2-3 sets of 4x400 with five hurdles on the track. His average was 65-68 seconds with a 50 second rest in between each interval. After four quarters he would rest for four minutes and then repeat. The speed workout was usually 2-3 miles in total. 2.5 mile warm up, 6-8 100m striders, 2 mile cool down. 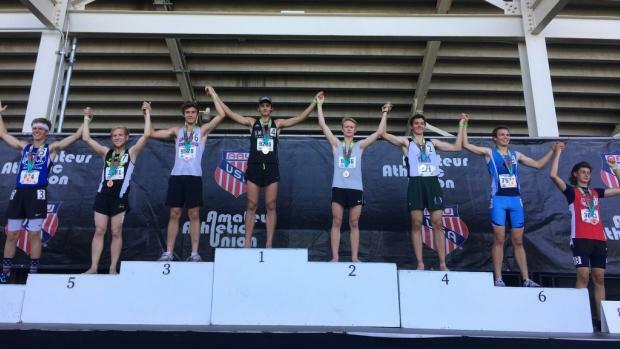 Foley's first taste of race action was at the AAU National Club Championships where he won the 17-18 year old 2k steeplechase in 6:16.02. With an added confidence from that meet, his game plan for the AAU Junior Olympic Games was to go in and get the win and hopefully come away with a new personal best and sub six minute time. "Everything was going great," he explained. "Then on the second to last water jump I took a really bad fall. That cost me the sub 6 and almost the win. I got myself together for the last 500m, kicked, and won." Foley didn't exactly hit his goal, but he did notch an eight second personal best. With two wins in two tries he is quickly finding a love for the event. "It feels amazing to win and to win again," said a joyful Foley. "I really love this event. I look forward to continuing my success and grow in this challenging event." Dylan Nelson of Oakleaf High School was third in the 15-16 year old 2k steeplechase.